The robust steel chassis ensures this quality lawn mower will deliver a superb finish for many years. Powered by a Honda GVC 135cc engine, this hand-propelled mower will manage fine lawns and has the power to cope if the grass gets a little out of hand. With a cutting height range from 20 to 70cm adjustable to 5 positions, you will be able to select the most appropriate finish. The 55 litre collector is easy to fit and remove for emptying, making this a very popular Mountfield mower. 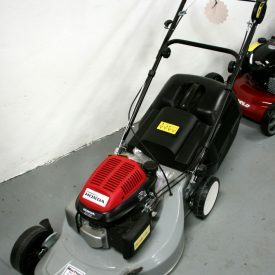 The 46cm/18" cutting width is suitable for lawns up to 1600 sq metres.